The archaeological site of Akrotiri, one of the most important ones in the Eastern Mediterranean, is once again open to the public. 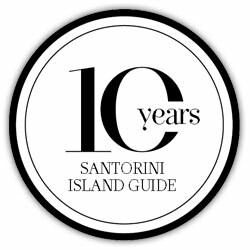 At the site, a tribute to the archaeological treasures of Santorini, thousands of past years will unfold before your eyes. Three million years ago, volcanic activity resulted in a scene of intense contrasts in colour and plasticity. Eruptions led to land formations; calderas sank 12 times within 400,000 years. Finally, islands were formed in the shape of a ring - today’s Santorini, Therasia and Aspronisi, with an separation between Aspronisi and Akrotiri. About five thousand years ago the first people arrived, drawn by the region’s unique climate and natural wealth. Survival was a challenge. Constant cultural development was their response to an unpredictable environment. At one time, an earthquake levelled the settlement. Accustomed to living in a ‘shaking’ land, the inhabitants returned and reconstructed their houses. By around 1650 B.C. they had created a coastal city of about 200 stremmata (200,000 square meters) with 30,000 inhabitants, multi-storey public buildings, earthquake-proof houses, and a sewage system. Carved stones, wall paintings, and rococo furniture provided decoration. Special animal breeding areas were located outside the residential settlement. The people of Akrotiri consumed wine, oil, fruit, fish paste, and grilled meat. Textile artisans, blacksmiths, metallurgists, stonecutters, shipbuilders, potters, and basketweavers made products that sailors transported to all Eastern Mediterranean coasts. It was probably in the spring of 1614 B.C. that a tremendous eruption occurred, burying the glorious city in 60km3 of volcanic material. It is believed that many people escaped. 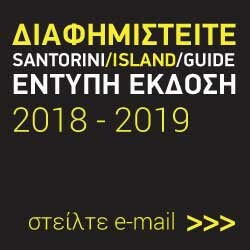 Although information and findings related to this civilisation had existed since the second half of the 19th century, the first excavations began in 1967 by Spyros Marinatos and are continued by Professor Christos Doumas. It is estimated that only 3% of the settlement has come to light. Mosaics, traces, and fossils dating back to more than 3,500 years ago, buried under huge amounts of ash, run the risk of becoming dust once they come to light. What is needed is a large number of scientists, fine handling to avoid destroying any findings, specialised preservation work, and money which, unfortunately, does not exist. The excavated site has been covered since 1968, which was considered pioneering at that time. Construction began on a new shelter roof to replace the older one in 1999. In 2005 a part of it collapsed and a new static study was conducted. The new bioclimatic shelter-roof consists of 2 successive roofs with an in-between gap for insulation. 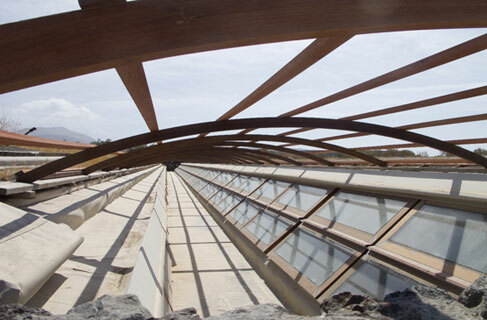 It has holes for ventilation/cooling and is covered with Theraic soil and low vegetation, in harmony with the landscape. 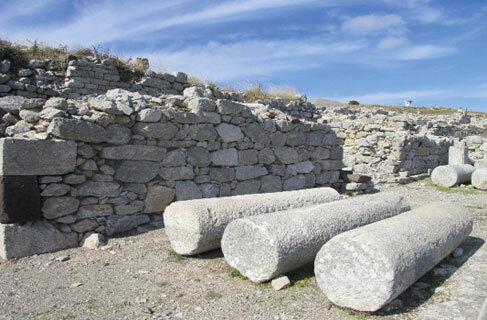 Its support elements do not rest on walls or foundations or open spaces (squares, streets), so as not to distort the architectural and aesthetic integrity of the prehistoric city. It takes at least 2 hours to visit the site. Almost all parts of the buildings have survived, apart from the roofs. You will have the opportunity to walk along the streets and squares of the city, visit dwellings and religious ritual areas, see installations for storage, workshops, cookhouses, mills and looms. Finally, you will see preserved details of the volcanic attack of the city, evidence of the dramatic termination of life in Akrotiri. The accompanying material is so meticulously elaborated that the visitor gets a global idea of life during that era. 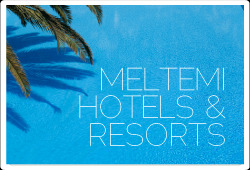 Thematic exhibitions are planned to take place on-site, so that a different aspect is promoted every time. The area is wheelchair-accessible and a medical office is available. Original mosaics are exhibited at the museum in Fira under controlled temperature and humidity (see next page). Many of them have been transported to Athens and are exhibited at the National Archaeological Museum. How To Get There: By bus or private car. Information tel. 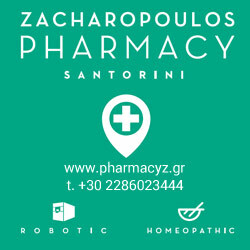 +30 22860 81366. Operating hours: Daily, except Monday, 10.00-17.00. 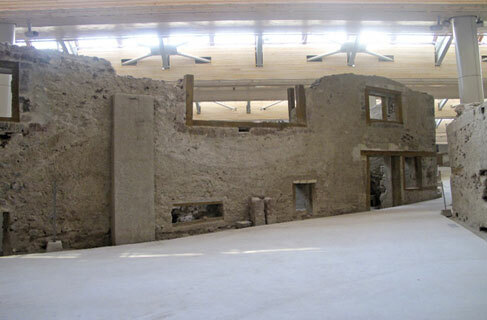 Once Akrotiri was completely destroyed, Thera remained uninhabited until the 8th century B.C., with very few exceptions. Then the Dorian colonists from Sparta arrived. Their leader was Thera, who gave his name to the island. The city was built on the western slope of the mountain called Mesa Vouno and became the urban centre controlling the whole island. 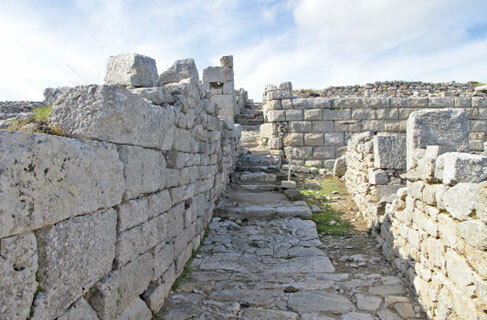 The city remained without walls due to its natural fortified position and was connected by a road with its two ports, Oia (Kamari today) and Elefsina (Perissa today). Very few traces have been found of the initial phase of the city. After the 4th century B.C., the city developed under the influence of the Ptolemies, Greek monarchs of the Egyptian kingdom. Later it was occupied by the Romans. The city deteriorated after the 3rd century A.D. and was abandoned after the 9th century. Excavations by German and Greek archaeologists began in 1896. Get ready for a lot of wind and a spectacular view. Dedicate at least one hour for visiting. There are seats in the shade to rest while you gaze at the sea and nearby islands. When approaching, you will see many carved rocks. These are the cemeteries, located outside the settlement because the presence of the dead in the city was regarded as ‘miasma’ (infection). 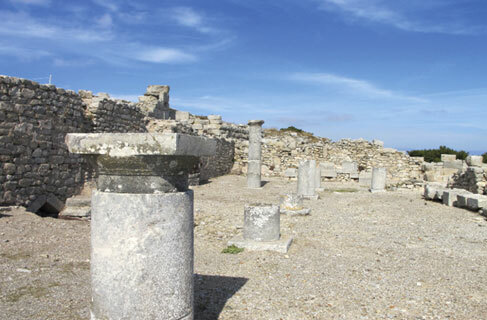 At the entrance of the settlement, there are ruins of ancient temples and two small Byzantine churches. On your right, you will see the shrine of Artemidoros, a priest from Pergi of Asia Minor. Guided by his dreams, he came to Thera, founded a shrine, and became a benefactor of the city. Animal-god symbols and inscriptions are carved on rocks. The Agora is reminiscent of squares in Medieval Cycladic villages. On your right stands the Royal Portico and, ahead on your left, is the City Theatre with its beautiful view of the Aegean. The southeastern edge of the island is not visitable, but you can see the top of the hill with the narrow island’s terraced streets, mansions, baths, religious edifices, and parts of the water supply and sewage system (sterns, pipes, public lavatories.) Most of those belong to the Hellenistic and Roman period (3rd B.C- 2nd A.D.). Do not miss the Gymnasium and Headquarters of the Ptolemaic Guards. 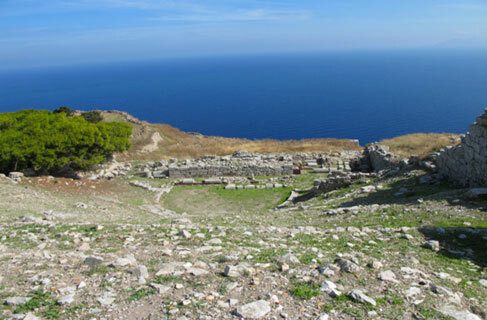 How To Get There: By car from Kamari, on foot from Kamari (either following the road or the path towards Zoodohos Pigi –they both begin from the same point) or on foot from Perissa (the path has shade almost until noon). Walking up will take you more than half an hour. Information tel. +30 22860 23217. Operating hours: Daily, except Monday, 8.30-15.00. Do not miss it. 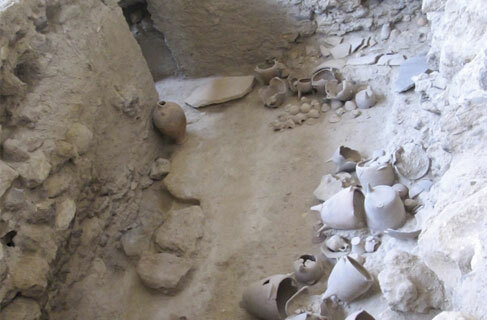 Within half an hour, you will be fascinated with excavation findings from prehistoric Akrotiri, exhibited in a highly interesting way. Main exhibits: original mosaics (with the exception of those transported to Athens exhibited at the National Archaeological Museum). Also: a collection of the famous Protocycladic marble figurines and the mold of a Louis V table formed after being covered with lava. You will find painted vessels of stone and clay, items of varied shapes, and copper tools and objects (fish hooks, censer, saw, firepoker, jewellery.) You will see the golden goat statuette that was found in 1999 during the foundation works of the new shelter - and much more. 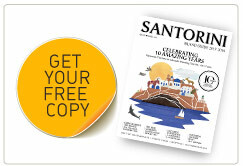 What would it be like if you came to Santorini 3.500 years ago? 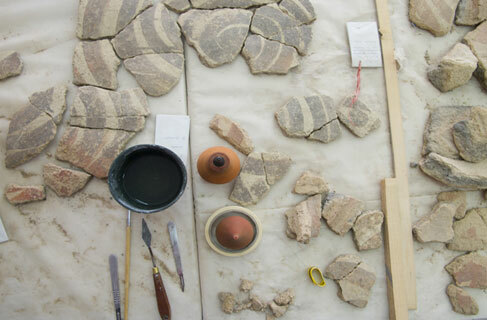 Here you can see 3D replicas of all the mosaics that have come to light in Akrotiri. You will sense the aesthetic ambiance of rooms in 1650 B.C.